During the summer of 2017, Carmelo Anthony was expected to join James Harden and the recently acquired Chris Paul at the Houston Rockets. The ambitious Western Conference outfit were looking to add a third star that could help them end the dominance of the Golden State Warriors, however, a move never happened, and Melo eventually ended up in Oklahoma City. Melo's surprise move to OKC meant that the 10-time All-Star would form part of another Big 3, and the trio of Anthony, Paul George, and Russell Westbrook was quickly dubbed the 'OK3'. 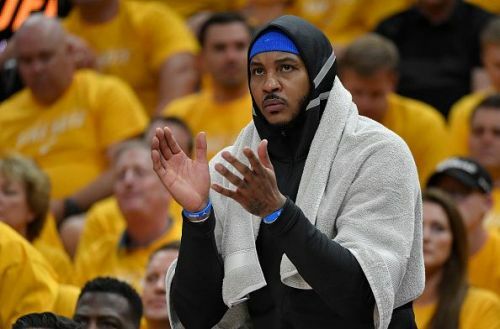 After struggling since the departure of Kevin Durant a year earlier, Melo's arrival seemed to put the Thunder in a position to once again compete, however, both OKC and Melo's season did not work out as planned. All season long, Billy Donovan struggled to get the best out of Melo, and the veteran himself repeatedly refused to come off the Thunder bench. There were a few high points for Anthony, such as his dominant performance during the Thunder's 148-124 win over LeBron James and the Cavs, although Melo's season as a whole was a disappointment, and here we will look at his worst performances in an OKC uniform. 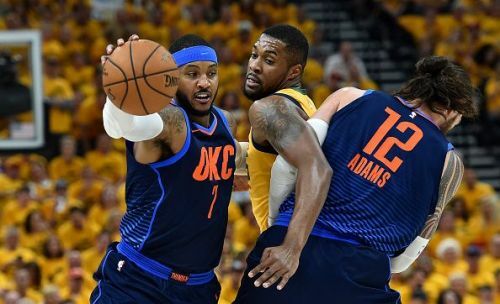 Anthony started the playoffs in fine form, scoring 15 points during an unselfish display in the Thunder's 116-108 Game 1 win over the Utah Jazz. Nevertheless, his performances quickly deteriorated as the series progressed, and his Game 4 performance was undoubtedly the low point. The Thunder entered the game 2-1 down in the series standings, and another disappointing 113-96 road defeat effectively ended their chances of mounting a series comeback. During the game, Melo shot 5 for 18 from the floor and also missed all six of his three-point attempts. The veteran would go on to play just two more games in an OKC uniform, scoring a combined total of 14 points.